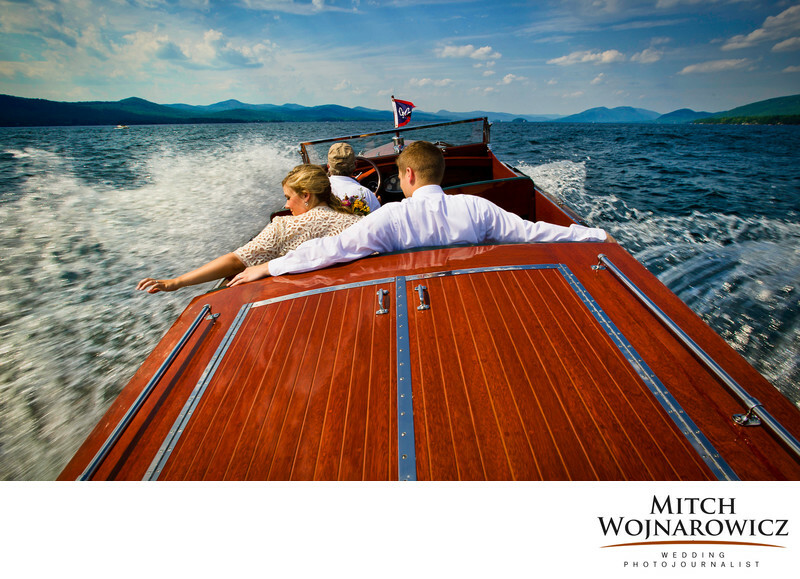 At their Lake George wedding Laura and Mike speed away on Lake George into the Adirondack Mountains in a vintage Chris Craft wooden speed boat. They rented the boat to use for a little private time after their wedding ceremony in Cleverdale. Together we spent about a half hour on the Lake going to the various islands and just traveling along the lake making photographs of the two of the newlyweds in the boat with the beautiful Adirondack weddings scenery surrounding them. Of course I made some controlled portraits as we stopped on various locations on the Lake. However as a wedding photojournalist, I love to keep shooting even win the planned photo session is complete. This moment where they are just sitting relaxed together playing with the water splashing past them, Is a favorite of mine. It is a bit of a nontraditional wedding photograph, but is exactly the sort of image I like to photograph on the wedding day. As a Lake George wedding photojournalist my approach is to make sure that the bride and groom spend as much time at their wedding and enjoying their families and wedding guests as possible. A service that I offer to all of my wedding clients is extensive planning and advice that begins soon after we book the wedding date. I won't be imposing my idea of how he your wedding day should go, and I won't be giving you a check list of what you must do on your wedding day. But you will get lots of suggestions drawn from my decades of experience photographing hundreds of weddings, many of them in the Adirondack Mountains and many of them on Lake George. From the suggestions you can formulate, with my assistance and guidance, the perfect plan for your wedding day. I will give you plenty of weddings schedule advice and before you know it you'll have a perfect plan for your wedding day. I have photographed weddings all over Lake George including working as a Silver Bay wedding photographer, hey Lake George wedding photographer and a Cleverdale wedding photographer. Let me put my experience to work for you. Just get in touch today so that we mak speak a little abut what you're looking for in a wedding photographer. Contact Me At This Link and I'll be in touch very soon!